As I’ve mentioned before, I’m often having to travel to Cleveland to meet with clients at NASA Glenn Research Center. As a result, I’ve ended up having a number of Cleveland restaurants that I get to semi-regularly visit and enjoy. I always get a hearty welcome from the folks at Greenhouse Tavern and Bar Cento, both of which I’ve written up in the past (and I visited both this trip as well, I’ll do an update post on Greenhouse Tavern later). But one place I’ve frequented several times, but haven’t yet written up is AMP 150. 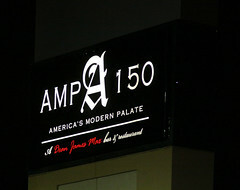 The AMP in AMP 150 stands for “America’s Modern Palate”, and that’s basically what AMP 150 is about, modern American food. Nestled into the Cleveland Airport Marriott, it’s the sort of place that you’d probably drive by several times wondering “Is that place good?” but never going inside, especially since the Cleveland Airport Marriott isn’t exactly the area’s most photogenic hotel. But inside, they’ve done a great job renovating the restaurant space, making for a ~200 seat restaurant with a nice lively decor. I should mention that I’m always a bit skeptical of restaurants in hotels, since the manager of the restaurant has to play to several crowds: the hotel bar crowd, the people coming for a good dinner, and the people staying at the hotel for which the restaurant is primarily a convenient option (or, if they don’t have a car, probably their only option). So this makes the restauranteur have to cater from everything from bar snacks, to modest dinners, to fancy entrees and tasting menus. And a lot of places can do some of these well, but not all of them. Luckily, AMP 150 seems to pull off the whole menu well. 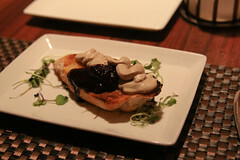 I first went to AMP 150 in 2009, back when it was a fairly new restaurant and Ellis Cooley was the executive chef. I’m surprised I didn’t write up that visit (I probably didn’t, since it was a rare trip to a restaurant where I didn’t have a camera), since one thing really stood out about that visit was that I came away impressed by, of all things, the mushroom soup. It was probably the finest mushroom soup I’ve ever had, and was accompanied by a tasting menu of dishes that were imaginative renditions of American classic dishes, executed perfectly. So AMP 150 has been on my “must revisit” list since then. And it has changed, primarily with chef Ellis Cooley leaving for Florida, replaced by local chef Jeff Jarrett. But the menu itself remains relatively unchanged, with the main focus being American cuisine, cooked up with a focus on high-quality local ingredients where possible. So I did like I’ve done previously, and opted for the tasting menu. AMP 150 primarily does the tasting menu as a “chef’s menu”, where the chef picks what you are getting (although they will attempt to accommodate tastes and preferences), which I usually enjoy, since the chef gets to show what they think is best, and I usually get something enjoyable that, left to my own devices, I might not have ordered. Well, AMP 150 opened strong, with a first course of a chicken mousse on a crouton. I usually don’t like mousses and pates, but this was a good, smooth, flavorful mousse, without any greasiness. This was quickly followed by a small cup of spicy gazpacho. I’m usually pretty disappointed in most gazpachos (most seem to taste to me like watery V-8), but this one didn’t disappoint at all. 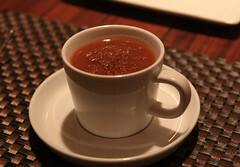 This was truly a powerful gazpacho, with really bold, spicy notes, especially pepper and celery. Despite that, it was still clean and refreshing. While I do find myself longing for the mushroom soup I had here twice when Ellis Cooley was the chef, this was definitely a good soup course. The next course was mussels. While these came out to the table looking like your typical black mussels, all I needed was the aroma to tell me that these weren’t like most mussels I’ve had. 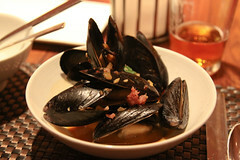 The broth on the mussels was basically Thai, with strong lemongrass and ginger notes and a coconut milk base. They also replaced the typical chorizo was replaced with Chinese sausage, and I think there was a hint of plum wine as well. Really, this reminded more of a good Thai dish than mussels, but it really matched up well. I’d get these again in an instant. This was then followed with a salad course of an heirloom tomato and manchego salad. This was good salad, but if I had to pick a weak course, this was it, since it was, essentially, just your run of the mill salad, decently done (and not overdressed), but not really pushing any frontiers. 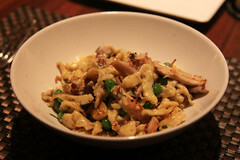 However, things picked up again with the next course, which was perfectly braised shreds of rabbit with a nice speck ham, and perfectly cooked spaetzle. Now here was a dish that was hitting on all cylinders: the rabbit was nicely tender, flavorful, and moist, the speck ham made for some nice little salted and smokey pockets as you were eating it, and the spaetzle was perfectly cooked, with a slightly toothsome texture, and the whole dish tied together with a light herb sauce and some peas to make a dish that was smooth and not gluey. This was one of the high points of the meal. The fish course that followed was simplicity itself: a small filet of herb encrusted trout, with local beans, tomato and avocado. Normally, this is the sort of course that would disappoint me as well (I’m not much of a fish lover), but here I was pleasantly surprised, since while this was a simple and straightforward dish and presentation, it was perfectly executed, nicely flaky and tender, and probably the second best fish I had this year (the best was the haddock at Bits and Druthers in Austin). 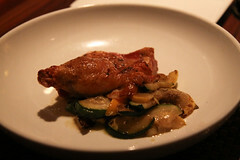 The main entree selected for me was roasted chicken with charred vegetables and a vinaigrette. Like the trout, the key here was in execution, since this was in essence just a roasted chicken breast. But this breast was prepared just as well as the the trout, with a perfectly cooked and moist interior, a crispy skin, and just salt and spice on the skin to give it a little pop. Dressed with some nicely charred veggies, this worked out perfectly. And then it was time for dessert. Usually at places like this, you can tell the dessert chef isn’t on the same par as the rest of the staff (sadly, this happens to me a lot). 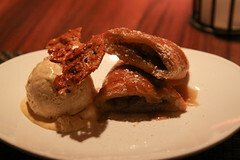 Whoever is doing the desserts at AMP 150 has their A game going, however, since they nailed this dessert: Apple turnover with spiced ginger ice cream, butterscotch and nut brittle. The turnover was nicely spiced and perfectly flaky, with some good, rich butter notes. The ice cream was very bold and spicy, yet paired well with the turnover. A little disk of butterscotch pecan brittle gave it some crunch. This was the perfect example of a contagious dish, since both of the tables adjacent to mine decided to re-think their dessert plans when seeing this dish arrive at my table. Overall, this was another excellent visit to AMP 150. If I had to pick something to be improved upon, I had a small quibble with the service. 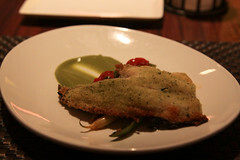 The waitstaff was pleasant, made good recommendations, and was knowledgeable about the menu and ingredients. Unfortunately, AMP 150 is one of those places where plates are delivered from the kitchen by runners directly to the tables… and the runners often didn’t know any details about what they were delivering. So in the case of a few of these courses, I’d get a dish, and aside from knowing that it was, well, fish of some sort, I’d have to wait until my waitress came by to find out the details of what I’m eating. Not a major issue, but I think it may help AMP 150 to get the runners in on the menu education a bit more. Overall, though, it was a very pleasant meal, with several outstanding small plate courses, for a reasonable price. While I’ve got a lot of favorite dinner spots in Cleveland, AMP 150 is going to stay in the rotation, and I’m looking forward to my next chance to visit.